Discussion in 'Civ5 - New Civilizations' started by JFD, Sep 2, 2012. Welcome to the CivFanatics Imperial Embassy! 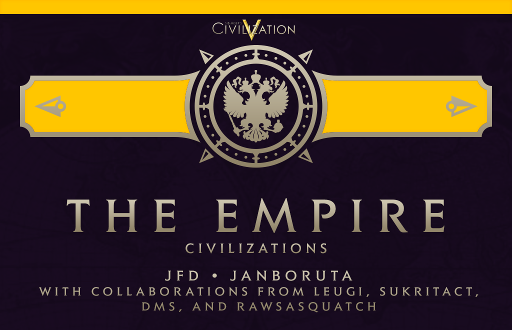 Here, you will find links to keep up-to-date with my Civilizations. These can be downloaded on Steam Workshop or directly through my Google Drive. For detailed information, see the JFDModding Wiki. Enable in Mods and click Next. For more detailed instructions, see Discord. Mod List (other mods you have active). Database and/or Lua log files. See here for instructions. I initially downloaded the USSR mod, and had it in my list for awhile. But it recently did an update and then disappeared. I attempted to unsubscribe and resubscribe from it but it still doesn't show up on my mod list. Was there a recent change to it on steam? Have you ever waged war on a Civ just to hear their war music? On that note; I'm sorry Attila, Suleiman, Augustus, Cathy, Theodora, Harun, Lizzy, Nebby, Isabella! Why do some of them replace civs? Henlo Pooky. I am speaking to you from the future but also the past. The raisin why some of them replace civs is because they actually don't. They used to ofc when you had to do so to get custom music working. But that was ages ago and idk why you would bring that up now. Have a nice day. Not at far as I know. I recently updated Prussia, Venice, the Goths, the Vandals and the Papal States with improved City lists and some art, but none of the rest. I'm not sure why it would claim there was an update for the USSR. Got it fixed with the steps you mentioned. Deleted the cache et al. Good thing is that this not only fixed my problem but also fixed a friend's problem with other mods . Can u upload your prussian civilization here too, plz?? how about the "long guys" as UU? Currently playing the Venetian Civ...So far I like it a lot. I kinda feel like it's a mixture of Carthage and the Mayans. By Mayan, I am referring to the strict planning. I started out with one city and focused on getting the colosseum national wonder and barrack one while getting great library and other wonders that give me a free building.. Then pumped out more cities since I spread the other buildings on them (libraries, markets, universities, monuments, etc). At the moment I have about 5 coastal cities (including Onondaga & CS), 3 interior cities (including Berlin). I've made a makeshift alliance with the Incas against the Russians, but the Incas are currently distrustful of my ways since I've conquered two capitals and a CS...but I have upgraded battleships that were originally the UU, so I don't need an open border to defend the Incas against Russian expansionism lol. I am focusing my land forces on the remaining Iroquois cities. Just curious about this. I listened to the songs on this mod. Any chance that you can use the Preussens Gloria instead? It wouldn't be difficult if you wanted to change the music for yourself. Just download the composition, rename it Bismarck_Peace/War and copy it into the mod folder. Otherwise, I personally rather the ones I currently have, even if the one you offered is honestly more appropriate. Oh thanks, that works then . If i were to disable the mod afterwards and play with regular germany would I need to manually re-add the original germany audio track or would disabling the mod automatically restore it to the default? Nope. It is the mod which tells the game to use the music files in its folder over the default music files, so just disable the mod and Germany will play its music as normal. Or you can just delete the music files in the mod folder, in order to keep Prussia and restore the German soundtrack. Excellent, thanks for the tip. Would it be possible at some point in the future to have versions which don't have the music, but likewise don't overwrite civs? Absolutely. As versions as such already exist it wouldn't be too much of a hassle to simply seperate them into an independant mod. I just worried it would become too cluttersome over the current method of one mod containing all of the different options (i.e. Non-Replacer, 3D Art, etc.). Perhaps if I do such I won't reupload them to the Workshop, but simply replace the versions here with Non-Replacers. Is this something you'd like me to do? Wait, there are already versions within the mod for this? Yeah. Under the "Important" heading in the first post it explains that each of the mods have the necessary files you need to use in order to use these Civs as standalone. I thought you may have missed that.